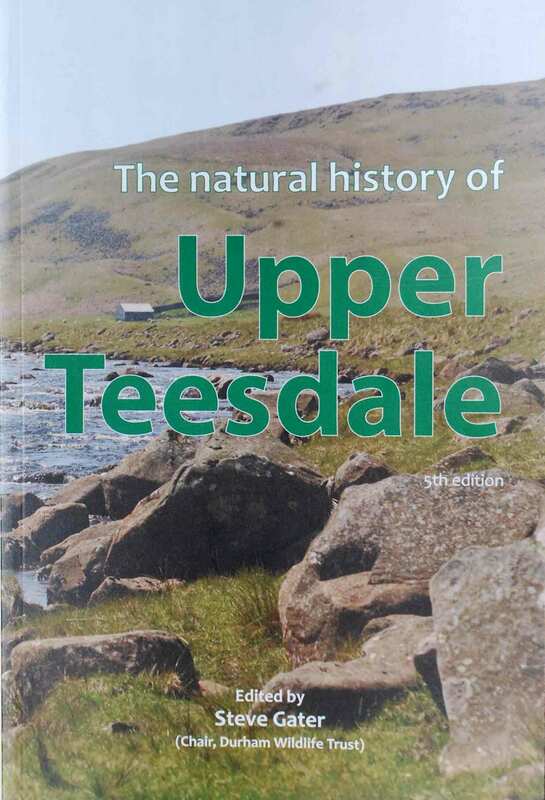 The first really warm weather of the year was a perfect excuse to visit Upper Teesdale and remind the world that spring gentians are not the only botanical wonders in this part of the world. 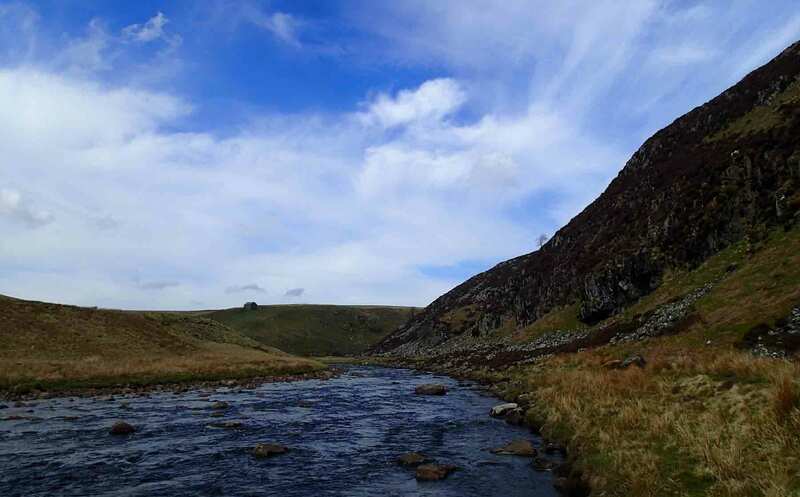 Our route to the gentians follows the course of the Tees up from Langdon Beck, alongside Falcon Clints (pictured above) and finally a scramble up beside Cauldron Snout to Widdybank Fell. 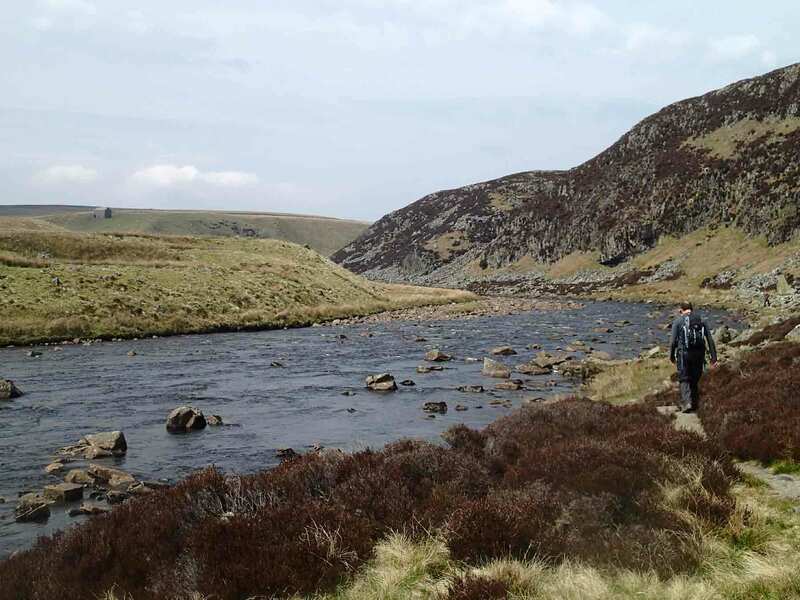 Along the way we saw birds eye primrose and butterworts growing alongside the path and, up on Widdybank Fell the spring gentians were approaching their best, and we saw some blue moor grass (Sesleria caerulea) too. 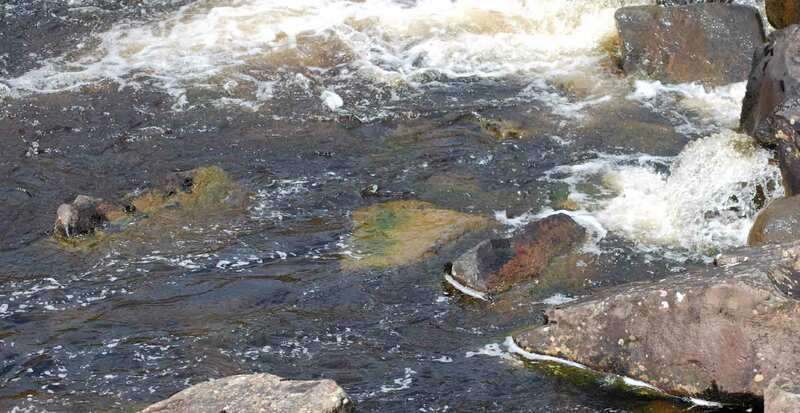 But my eyes were focussed beyond the terrestrial vegetation, and soon homed in on some green films in the river as we were sitting down to eat our lunch. I had not come prepared for fieldwork today, so had to lean out precariously from the bank to grab a sample which I then had to store in an empty Twiglets bag for the journey home. I had a hunch that I had found some more Ulothrix zonata (see “Bollihope Burn in close up …”) but could not be sure in the field. The film of algae on the rock surface was slimy, and, as far as I could tell with the naked eye, unbranched, but there are other algae that share these properties and I could not know for sure until I had a specimen under my microscope. 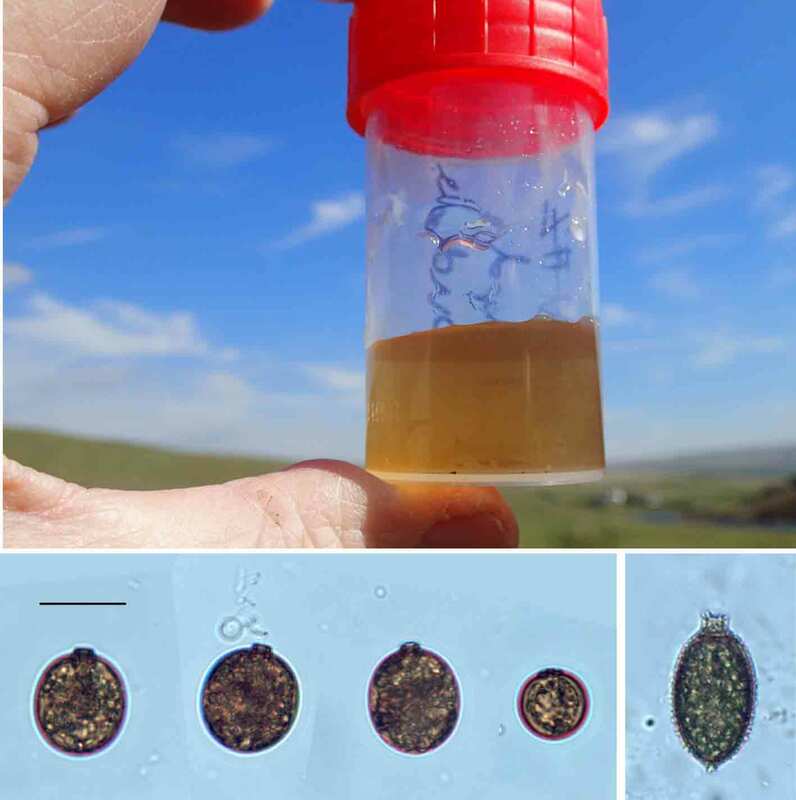 This means that algal natural history lacks the immediacy that is associated with larger organisms and one of my campaigns this year is to see just how much can be achieved with field microscopes. Today, however, was supposed to be a day off. Hence the need to requisition a Twiglets packet. Ulothrix zonata on the surface of a submerged boulder in the splash pool below Cauldron Snout, Teesdale, May 2016. In contrast to my usual close-up views of the algal world, this was taken with a 300 mm telephoto lens. 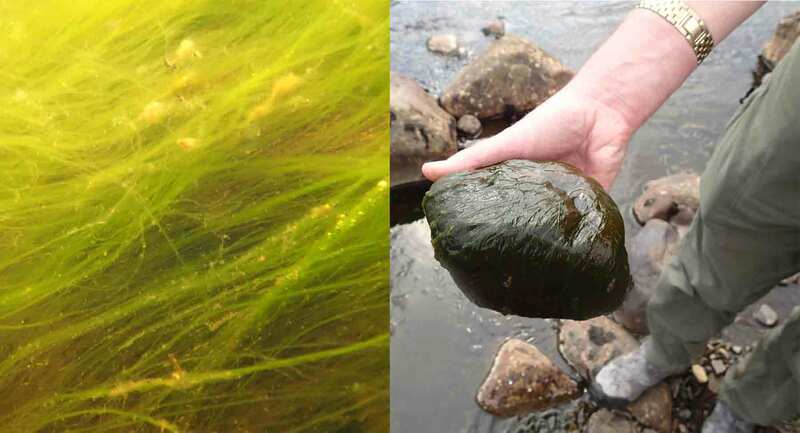 The pictures below reiterate the comments I made in my earlier post about the problems we have appreciating the three-dimensional structure of microscopic algae when removed from their natural habitat: the left hand image was taken underwater with my Olympus TG2 camera in macro mode and shows the filaments supported by the fast-flowing water of the Tees; the right hand view shows them collapsed into a gungy green slime on top of a cobble that I have removed from the edge of the river. It is equivalent to looking at a mass of wracks and kelp smothering a rocky shore at low tide and trying to imagine these as the vertical fronds of a “kelp forest” at high tide. Ulothrix zonata in the River Tees, near Falcon Clints, May 2016. Left: close-up view of filaments in situ, taken underwater with an Olympus TG2 camera; right: a cobble removed from the margins of the river. Looking down the microscope, there were definite signs that this was late season Ulothrix, even if it was not so overgrown as the population I had seen at Bollihope Burn. First, the chloroplasts were not in a particularly healthy state – earlier in the year they would encircle most of the cell, whereas now they seem to be shrivelled and fill less than half of the cell length. Second, there were several cells in “reproductive” mode, forming zoospores. And, third, there was an abundance of epiphytes, particularly on those that had already released their zoospores. Had I come earlier in the year, I would have expected to see filaments virtually free of attached algae. Now, they were abundant. Many of the epiphytes were diatoms, similar to those I described from Bollihope Burn, but there were a few groups of a different alga, which I initially thought was either Characium or Characiopsis but which is more likely to be a germling of Ulothrix zonata that has grown from one of the zoospores. There are nuances to the natural history of this nondescript green slime. Studies in the North American Great Lakes have shown that it thrives in high light conditions, in the shallow littoral (less than a metre deep in the littoral) and grows best when the temperature is less than five degrees. This gives it a window of opportunity in our northern England streams, thriving in the late winter and spring before tree cover reduces the light available. It is not the only alga that likes cool temperatures, and the quid pro quo of this habit is that it needs to produce copious mucilage in order to stop epiphytes growing on the cell wall and blocking out the light that it craves. As days get longer and the water becomes warmer, so the organism shifts to a reproductive mode, producing zoospores and, from those, zygotes, that can hunker down and survive the inhospitable conditions that we call “summer”. Oh yes, we saw a ringed plover too. Almost forgot. Ulothrix zonata from the River Tees, near Falcon Clints, May 2016. 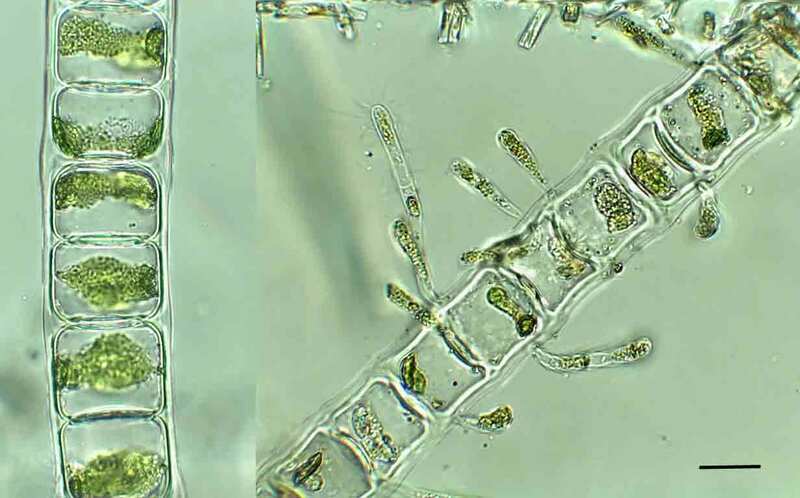 Left: vegetative cells with degrading chloroplasts; right: “dead” cells with epiphytic cells that are probably germlings produced by U. zonata zoospores. Scale bar: 25 micrometres (=1/40th of a millimetre). Auer, M.T., Graham, J.M., Graham, L.E. & Kranzfelder, J.A. (1983). Factors regulating the spatial and temporal distribution of Cladophora and Ulothrix in the Laurentian Great Lakes. Pp. 135-145. In: Wetzel, R.G. (editor) Periphyton of Freshwater Ecosystems. Dr W. Junk, The Hague. Graham, J.M., Kranzfelder, J.A. & Auer, M.T. (1985). Light and temperature as factors regulating seasonal growth and distribution of Ulothrix zonata (Ulvophyceae). Journal of Phycology 21: 228-234. The microscopic world of an Upper Teesdale Sphagnum bog revisited, with diatoms and desmids living on and in the spaces between Sphagnum leaves and diatoms The chlorophyllose cells are about ten micrometres in diameter (1/100th of a millimetre) whilst the desmid in the foreground (Cosmarium ralfsii) is about 100 micrometres (1/10th of a millimetre) across. 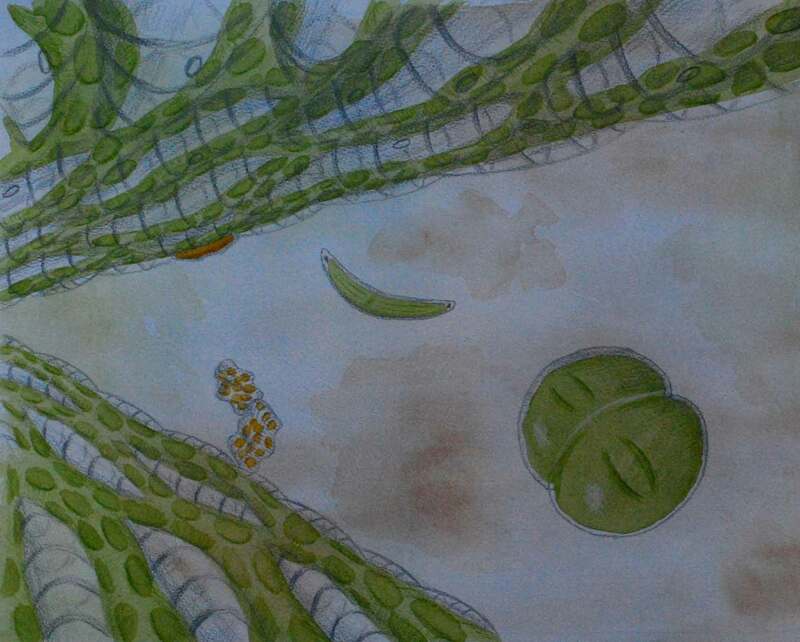 I showed my first attempt at portrayal of the microscopic life of a Sphagnum bog a few weeks ago (see “Swimming with desmids …“) but, at the same time, I felt that there were a few elements that could be improved, so here is my second effort. The first time I tackle a new subject, there are usually technical issues to address and, perhaps, the outcome was not quite as naturalistic as I would have liked. Not that I, or anyone else, really has a great insight into “natural” in this particular context, but then none of us have seen dinosaurs hunting in Jurassic forests, but that hasn’t stopped people producing “naturalistic” illustrations. 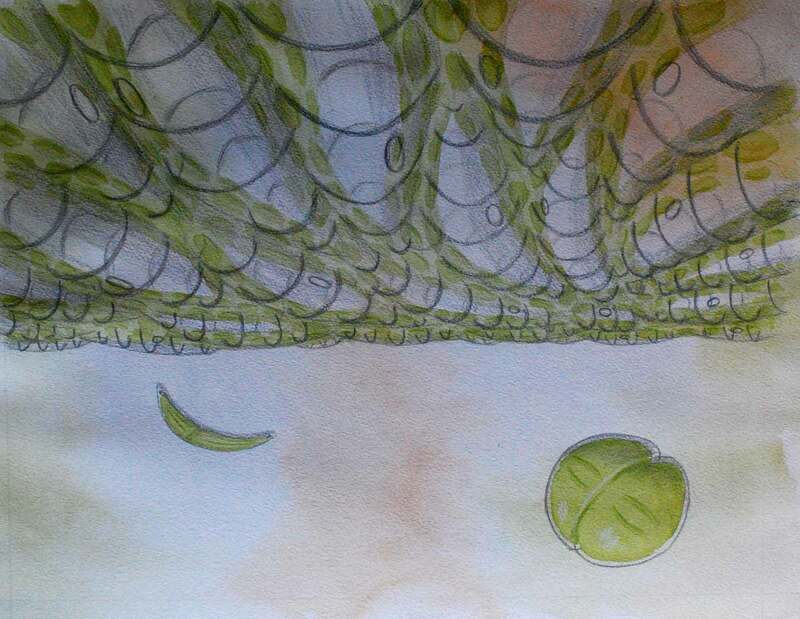 In my first picture, just capturing the underside of a Sphagnum leaf in something approaching linear perspective and including two desmids seemed like progress. This time, there are two Sphagnum leaves plus a couple of diatoms – a single cell of Eunotia implicata on the underside of one leaf, plus a couple of cells of Tabellaria flocculosa on the other leaf. Both of these specimens were present when I made my initial observations of the Sphagnum leaves back in December. One additional issue that the composition of this picture raised, is that the morphology of the upper surface of a Sphagnum leaf differs from that of the lower surface. This relates to the relative size of the chlorophyllose and hyaline cells (see the schematic diagram in Swimming with desmids ...). There were moments, I promise you, when I interrupted my meditations on Sphagnum morphology to wonder if I should go and get a life. My justification, if any is needed, is that peering down a microscope and compiling data about the species present without sometimes contemplating the organisms in their natural state seems like an equally bizarre way of spending one’s life. I write this post having peer-reviewed a paper for the journal Limnology and Oceanography this afternoon. The work was quite interesting but, at the same time, I felt that it was a very sterile, technical study that had abstracted the real world into long lists of diatom species and then processed these using complicated statistical methods, without giving much sense of a real understanding of the ecosystems that they were studying. 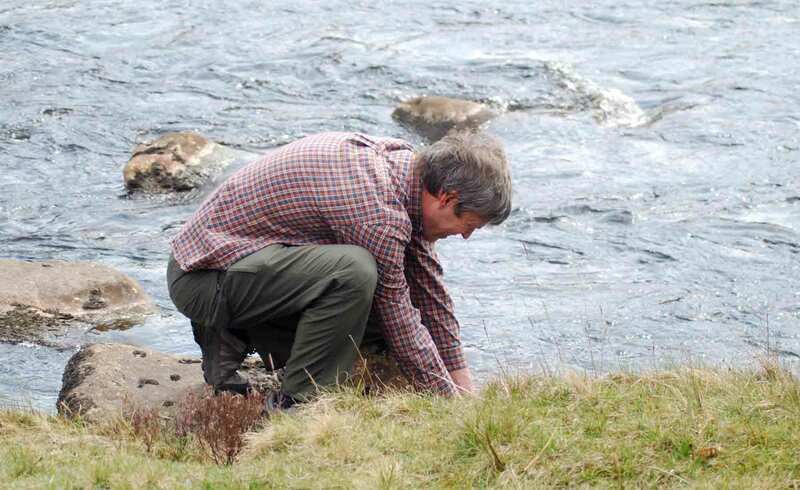 My sampling trip to Upper Teesdale in search of desmids (see “Hunting for desmids in Upper Teesdale”) has now yielded another picture, this time figurative rather than semi-abstract. I have tried to depict the world inside a Sphagnum bog so have shown two desmids underneath a canopy of Sphagnum leaves. The Sphagnum leaves have a characteristic structure, with chlorophyllose cells alongside water-filled “hyaline” cells. The desmids live, in effect, inside a glass-roofed conservatory although I have probably conveyed an overly bright impression of the subaquatic world of the bog. 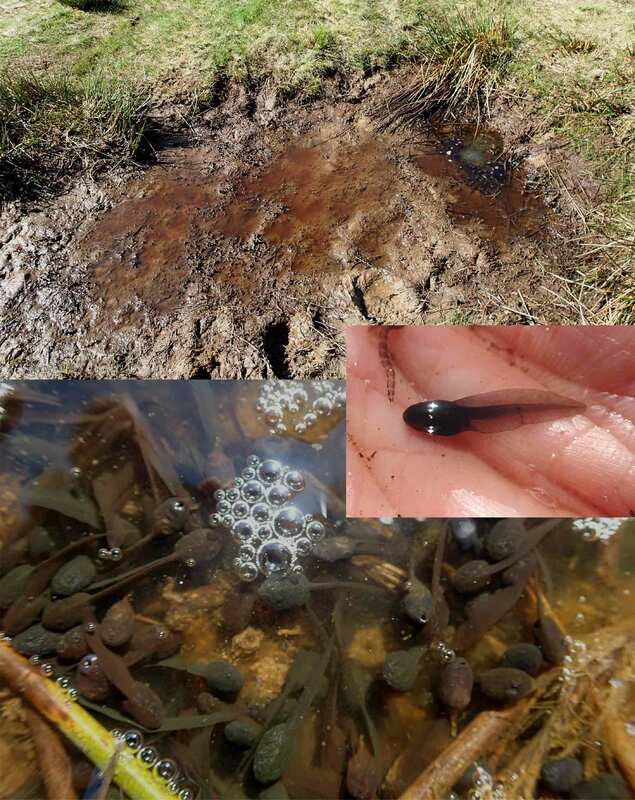 The reality is that the slow decay of Sphagnum yields brown humic materials that create an altogether murkier environment. The microscopic world of an Upper Teesdale Sphagnum bog, with desmids living in the space underneath Sphagnum leaves. The chlorophyllose cells are about ten micrometres in diameter (1/100th of a millimetre) whilst the desmid in the foreground (Cosmarium ralfsii) is about 100 micrometres (1/10th of a millimetre) across. I’ve tried to illustrate the structure of a Sphagnum leaf in the diagram below. Compare this with the photograph in “More from Upper Teesdale” (showing the view from above) the leaf to get an idea of how the leaf is constructed. It also demonstrates why Sphagnum moss is capable of absorbing so much water: two-thirds or more of the leaf is composed of empty space and there is even a convenient pore to let the water in. A schematic cross-section through a leaf of Sphagnum showing the arrangement of hyaline and chlorophyllose cells. The chloropyllose cells are about 10 micrometres (1/100th of a millimetre) across. My illustration of the microscopic world of a Sphagnum bog is a step outside my comfort zone, as I tried to combine the various elements together from separate microscopic images. Microscopy tends to flatten perspective, partly because specimens are squashed onto microscope slides but also because of the focal length of the lenses involved. Added to this was the problem of depicting the sinuous chlorophyllose cells in an approximation of single-point perspective. Almost as soon as I had finished the picture, I was thinking about how I could be improving the next version. Striving towards realism is, itself, an ongoing mind experiment that offers tantalising glimpses of an otherwise hidden world.